Fifteen-year-old Lloyd Alley, arrested today in Los Angeles, is said to have made statements “tantamount to a confession” of his involvement with the “Sacred School of the Great White Brotherhood,” an Oakland-based “love cult” with branches in San Francisco, San Jose, Portland, Chicago, and Texas. At the same time the teenager was spilling the beans in L.A., San Francisco police raided the cult’s Bay Area headquarters, where they found an “effigy of a woman with a sword piercing her heart, incoherent messages, cards bearing linked names of males and females and other equally weird evidence.” Cultists are said to have “encouraged free love in its most exotic forms” in its attempts to breed a “superman” and “superwoman.” “Mystical marriages” were arranged and “the sacred phallic laws” studied. Also in custody in Los Angeles is Russell Alley (Lloyd’s father, cult name “Omar”). Cult founder and high priestess, Mrs. Gertrude Wright (“Zareda” to her followers), is being held in Oakland, along with her disciple, Irma Gibbs (“Ermengarde,” a domestic in the Wright home). All were charged with contributing to the delinquency of minors: Lloyd Alley, plus two young women, Thelma Reid, 17, and Caroline Merwin, 18. 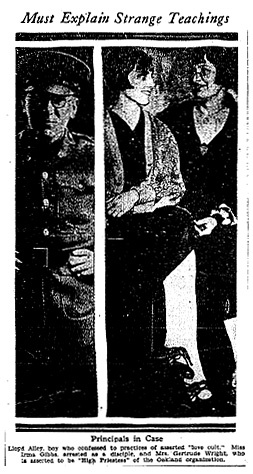 Lloyd Alley and Irma Gibbs both made confessions said to “be reeking with unprintable details,” though the paper managed to squeeze in a mention of two “new Messiah” ceremonials Lloyd performed with Caroline Merwin. Caroline (whose stepmother’s complaint set the raid in motion) was quite the little minx: when she appeared in juvenile court later in the week she relished telling the judge that she wore only “filmy underthings” during her initiation ceremony, and that her “vibration robes” were scanty as well. When she “admitted intimacies with Lloyd Alley,” the two of them laughed until the judge admonished them to be quiet. The attempt to paint these girlsâ€”and their beef-fed sheiksâ€”as innocent, wide-eyed victims of a freak religion is enough to make anybody laugh. Girls of this day and age are wise guys. And any one of them knows that a so-called religious cult that involves being “initiated” in the presence of men with most of clothes off is merely an excuse for a debauch. There is at least some hope for a girl who is frank enough to laugh. Caroline Merwin was eventually released into her stepmother’s custody. Lloyd Alley was remanded into the custody of the Juvenile Detention Home and was later made a ward of the court. In May 1927, a jury deliberated for ten minutes before it found Russell Alley guilty of contributing to the delinquency of minors. Gertrude Wright and Irma Gibbs flew the coop before they could be tried; they remain at large.